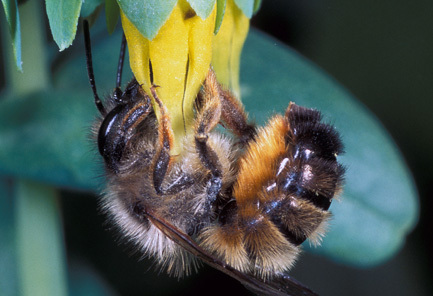 The subgenus Osmia Panzer is distributed both in the Palaearctic and the Nearctic region. It contains 29 described species, 27 of which occur in the Palaearctic. 1 species is still undescribed (A. Müller, unpublished). The North American species Osmia lignaria Say, which has been introduced at one locality in Spain (Ortiz-Sánchez, 2011), is not listed below. Due to the close morphological resemblance, the species of the former subgenera Monosmia and Orientosmia are included here in the subgenus Osmia, which was found to be paraphyletic in its former circumscription (Haider et al., 2013). Female of Osmia (Osmia) cerinthidis Morawitz, 1876 collecting pollen on Cerinthe (Boraginaceae), the species’ exclusive pollen source. Foto A. Gogala. 1853 Osmia apicata Smith, Catalogue of Hymenopterous Insects in the Collection of the British Museum, vol. 1, p. 140. Type material: Lectotype f, by designation of Tkalcu (1974b: 339), “Albania” [Albania], BMNH (London). Type species of Monosmia Tkalcu. 1869 Osmia macroglossa Gerstaecker, Entomologische Zeitung (Stettin), 30: 349. Type material: Lectotype f, by designation of Tkalcu (1974b: 339), “Griechenland” [Greece], ZMHB (Berlin).-Combination Osmia (Aceratosmia) macroglossa Gerstaecker in Schmiedeknecht (1885: 19 ). Combination Osmia (Pachyosmia) macroglossa Gerstaecker in Friese (1911b: 124).-Synonymy in Tkalcu (1974b: 339). Distribution-Europe: AL, ARM, BG, I, GE, GR, HR, MK, RUS, SCG, SLO. Southwestern Asia: IL, IR, JOR, SYR, TR. Identification-Keys, Descriptions: Ducke (1900); Medvedeva (1978); Peters (1978a), Schmiedeknecht (1885-1886); Tkalcu (1974b: 337-339). Flower preferences: Oligolectic on Boraginaceae with a strong preference for Onosma (Teppner, 1996; Gogala and Surina, 2011; Haider et al., 2013). 1875 Osmia maxillaris Morawitz, Travel to Turkestan by A. P. Fedtschenko, p. 82. Type material: Lectotype m, by designation of Peters (1978a: 317) “in valle Sarafschan, Warsaminor, Obburden, Iskander” [Tajikistan], ZIN (St. Petersburg); paralectotypes m, ff. Type species of Orientosmia Peters.-Combination Osmia (Pachyosmia) maxillaris Morawitz in Friese (1911b: 125). Distribution-Northern Asia: KS, TJ, UZ. Identification-Keys, Descriptions: Ducke (1900); Peters (1978a); Müller (2012b). Flower preferences: Oligolectic on Fabaceae with long flower corollas, e.g. Astragalus (Müller, 2012b; Haider et al., 2013). 2012 Osmia (Orientosmia) maxschwarzi Müller, Journal of the Swiss Entomological Society, 85: 29. Type material: Holotype m, “Firuzkuh county, Markazi district, 28km E of Firuzkuh, Peynap valley, 2450m” [Iran], ETHZ (Zürich); paratypes mm, ff. 1978 Osmia (Orientosmia) maxillaris scheherazade Peters, Senckenbergiana Biologica (Frankfurt), 58: 319. Type material: Holotype m, “Gürün” [Turkey], SMFD (Frankfurt); paratypes mm, ff. 1978 Osmia (Orientosmia) maxillaris dinazade Peters, Senckenbergiana Biologica (Frankfurt), 58: 319. Type material: Holotype m, “Pul-i-chatum (an der Grenze von Turkmenien)” [Iran], ZIN (St. Petersburg); paratype m.-Synonymy in Müller (2012b: 28). Flower preferences: Possibly oligolectic on Fabaceae with long flower corollas, e.g. Astragalus (Müller, 2012b; Haider et al., 2013). 1978 Osmia (Osmia) ariadne Peters, Senckenbergiana Biologica (Frankfurt), 58: 296. Type material: Holotype f, “W-Kreta, Meskla” [Greece: Crete], SMFD (Frankfurt); paratype f.
Identification-Keys, Descriptions: Zanden (1986: 72). 1758 Apis bicornis Linnaeus, Systema Naturae, 10th edn, vol. 1, p. 575. Type material: Holotype f, “in Europa” [Sweden], LSUK (London). Type species of Osmia Panzer.-Combination Osmia (Ceratosmia) bicornis (Linnaeus) in Schmiedeknecht (1885: 19 ).-Synonymy with Osmia rufa (Linnaeus) in Dalla Torre (1896: 407) and in Warncke (1986: 121), but see Day (1979: 51, 70). 1758 Apis rufa Linnaeus, Systema Naturae, 10th edn, vol. 1, p. 575. Type material: Lectotype m, by designation of Day (1979: 70), “in Europa” [Sweden], LSUK (London).-Combination Osmia (Pachyosmia) rufa (Linnaeus) in Friese (1911b: 126). Combination Osmia (Osmia) rufa (Linnaeus) in Zanden (1988b: 127).-Synonymy in Kirby (1802: 273) and in Day (1979: 51, 70). Distribution-Europe: A, AL, AND, ARM, B, BG, BY, CH, CZ, D, DK, E, E(Ba), F, F(Co), FIN, FL, GB, GR, H, HR, I, I(Sa), I(Si), IRL, L, LT, LV, MK, N, NL, P, PL, RO, RUS, S, SK, SLO, UA. Northern Africa: DZ, MA, TN. Northern Asia: KS, KZ, RUS(FS), TM; J. Southwestern Asia: CY, IL, IR, SYR, TR. Identification-Keys, Descriptions: Amiet et al. (2004); Banaszak and Romasenko (2001); Benoist (1931); Ducke (1900); Medvedeva (1978); Móczár (1958); Peters (1978a); Radoszkowski (1887a: 279); Romankova (1984); Scheuchl (1996); Schmiedeknecht (1885-1886). Flower preferences: Polylectic; pollen sources include plants belonging to 19 different families; flowers containing no or very little nectar, such as Ranunculus (Ranunculaceae), Quercus (Fabaceae), Papaver (Papaveraceae) or Cistaceae, are the predominant pollen hosts (Amiet et al., 2004; Westrich, 1989; Haider et al., 2013). 1758 Automatically established nominotypical subspecific taxon (original description and type specimen are identical with those of the species rank taxon of the same name above).-Combination Osmia rufa rufa (Linnaeus) in Peters (1978a: 290). 1776 Apis agino Harris, Exposition of English Insects, p. 163. Type material: m(m), [England].-Synonymy in Peters (1978a: 290). 1844 Osmia hedera Smith, The Zoologist (London), 2: 747. Type material: Holotype m, “Hampshire” [United Kingdom].-Synonymy in Tkalcu (1977b: 232). 1899 Osmia rufa borealis Ducke, Entomologische Nachrichten (Berlin), 25: 215. Type material: Holotype f, “aus Norwegen” [Norway], NMW (Wien).-Combination Osmia (Pachyosmia) rufa borealis Ducke in Friese (1911b: 126).-Synonymy in Tkalcu (1977b: 232). Distribution-Europe: AND, DK,E, F(Co), FIN, GB, I(Sa), I(Si), IRL, N, P, S. Southwestern Asia: IR. Identification-Keys, Descriptions: Ducke (1900); Peters (1978a). 1763 Apis globosa Scopoli, 1763, Entomologia Carniolica, p. 300. Type material: Neotype m, by designation of Warncke (1986: 74), “Klagenfurt, Kärnten” [Austria], ZSM (München).-Combination Osmia rufa globosa (Scopoli) in Warncke (1986: 100). 1790 Apis cornigera Rossi, Fauna Etrusca, vol. 2, p. 108. Type material: f(f), [Italy].-Combination Osmia rufa cornigera (Rossi) in Peters (1978a: 294).-Synonymy in Warncke (1986: 94). 1799 Apis fronticornis Panzer, Faunae Insectorum Germanicae, 63: 20. Type material: f(f), [Germany].-Synonymy with Osmia rufa cornigera (Rossi) in Peters (1978a: 294). Synonymy with Osmia rufa globosa (Scopoli) in Warncke (1986: 98). Distribution-Europe: A, AL, ARM, B, BG, BY, CH, CZ, D, DK, E, F, F(Co), FL, GR, H, HR, I, I(Si), L, LT, LV, MK, NL, PL, RO, RUS, S, SK, SLO, UA. Northern Africa: TN. Northern Asia: KS, KZ, RUS(FS), TM. Southwestern Asia: CY?, IL, IR, SYR, TR. Identification-Keys, Descriptions: Peters (1978a); Radoszkowski (1887a: 280). 1895 Osmia fracticornis Pérez, Espèces nouvelles de mellifères de Barbarie, p. 10. Type material: Syntypes m(m), f(f), [Algeria], MNHN (Paris).-Combination Osmia (Pachyosmia) fracticornis Pérez in Friese (1911b: 126). Combination Osmia rufa fracticornis Pérez in Peters (1978a: 295). Distribution-Europe: E(Ba), I(Sa), I(Si). Northern Africa: DZ, MA, TN. 1876 Osmia cerinthidis Morawitz, Horae Societatis Entomologicae Rossicae (St. Petersburg), 12: 41. Type material: f(f), “Borshom” [Georgia], ZIN (St. Petersburg).-Combination Osmia (Ceratosmia) cerinthidis Morawitz in Schmiedeknecht (1885: 19 ). Combination Osmia (Pachyosmia) rufa cerinthidis Morawitz in Friese (1911b: 126). Distribution-Europe: A, ARM, BG, CZ, D, F, GE, GR, I, I(Si), MK, PL, RO, RUS, SK, SLO, UA; B. Northern Asia: RC?. Southwestern Asia: IR, TR. Identification-Keys, Descriptions: Amiet et al. (2004);Banaszak and Romasenko (2001); Ducke (1900, as Osmia rufa var. cerinthidis); Medvedeva (1978); Peters (1978a); Scheuchl (1996); Schmiedeknecht (1885-1886); Wu (2006). Flower preferences: Oligolectic on Boraginaceae with a strong preference for Cerinthe (Boraginaceae) (Amiet et al., 2004; Westrich, 1989; Haider et al., 2013). 1876 Automatically established nominotypical subspecific taxon (original description and type specimen are identical with those of the species rank taxon of the same name above). Distribution-Europe: A, ARM, CZ, D, F, GE,GR, I,MK, PL, RUS, SK, SLO, UA.Northern Asia: RC. Southwestern Asia: IR, TR. 1978 Osmia (Osmia) cerinthidis crassiclypeata Peters, Senckenbergiana Biologica (Frankfurt), 58: 299. Type material: Holotype f, “Palermo” [Italy: Sicily], Schwarz Collection (Ansfelden). 1887 Chalicodoma cornifrons Radoszkowski, Horae Societatis Entomologicae Rossicae (St. Petersburg), 21: 430. Type material: f(f), “Korée” [Korea].-Combination Osmia (Ceratosmia) cornifrons (Radoszkowski) in Gussakovskij (1932: 61). Distribution-Northern Asia: J, RC, ROK, RUS(FS); Korea. Extralimital: Nearctic (USA) [Introduced]. Identification-Keys, Descriptions: Romankova (1984, 1985b: 943-944, 1995); Wu (2006); Yasumatsu and Hirashima (1950). Flower preferences: Polylectic; pollen sources include plants belonging to 9 different families; flowers of Fabaceae are important pollen hosts (Quest, 2009; Haider et al., 2013). 1805 Megachile cornuta Latreille, Histoire Naturelle des Crustacés et des Insectes, vol. 14: 59 [not seen]. Type material: [France]. Combination Osmia (Ceratosmia) cornuta (Latreille) in Schmiedeknecht (1885: 19 ). Combination Osmia (Pachyosmia) cornuta (Latreille) in Friese (1911b: 127). Distribution-Europe: A, AND, ARM, B, BG, CH, CZ, D, DK, E, E(Ba), F, F(Co), FL, GE, GR, GR(Cr), H, I, I(Sa), I(Si), L, MK, NL, P, PL, RO, RUS, SK, SLO, UA. Northern Africa: ET, DZ, TN. Northern Asia: KZ, TM; Turkestan. Southwestern Asia: CY, IR, SYR, TR. Identification-Keys, Descriptions: Amiet et al. (2004); Banaszak and Romasenko (2001); Benoist (1931); Ducke (1900); Medvedeva (1978); Móczár (1958); Peters (1978a); Radoszkowski (1887a: 291-292); Scheuchl (1996); Schmiedeknecht (1885-1886). Flower preferences: Polylectic; pollen sources include plants belonging to 13 different families; flowers of Rosaceae are the most important pollen hosts (Amiet et al., 2004; Westrich, 1989; Haider et al., 2013). 1805 Automatically established nominotypical subspecific taxon (original description and type specimen are identical with those of the species rank taxon of the same name above). Distribution-Europe: A, AND, B, CH, CZ, D, DK, E, E(Ba), F, F(Co), FL, GR, H, I, I(Sa), I(Si), L, MK, NL, P, PL, RO, RUS, SK, SLO, UA. Northern Africa: DZ, TN. Northern Asia: KZ. 1920 Osmia divergens Friese, Deutsche Entomologische Zeitschrift (Berlin), 1920: 51. Type material: Lectotype f, by designation of Peters (1978a: 304), “Turkestan” [Turkestan], ZMHB (Berlin).-Combination Osmia (Osmia) cornuta divergens Friese in Peters (1978a: 304). Distribution-Northern Asia: TM; Turkestan. Southwestern Asia: IR. 1938 Osmia neoregaena Mavromoustakis, The Annals and Magazine of Natural History (London), ser. 11, 2: 471. Type material: Holotype f, “Saittas, 2500 ft” [Cyprus], DAAN (Nicosia); paratypes mm, ff.-Combination Osmia (Osmia) cornuta neoregaena Mavromoustakis in Peters (1978a: 304). Distribution- Europe: GR(Lesbos). Southwestern Asia: CY. 1978 Osmia (Osmia) cornuta quasirufa Peters, Senckenbergiana Biologica (Frankfurt), 58: 303. Type material: Holotype f, “Kingi (Maryut, sw von Alexandria) im Garten” [Egypt], SMFD (Frankfurt); paratypes mm, ff. Distribution-Europe: ARM, GE, GR(Chios, Cr?). Northern Africa: ET. Southwestern Asia: IR, SYR, TR. 1978 Osmia (Osmia) cyrenaica Peters, Senckenbergiana Biologica (Frankfurt), 58: 308. Type material: Holotype m, “Cyrenaica, Cyrene, 1800 feet” [Libya], BMNH (London); paratype m.
1903 Osmia (Chalcosmia) excavata Alfken, Zeitschrift für Systematische Hymenopterologie und Dipterologie, 3: 210. Type material: f(f), “Tokio” [Japan], ZMHB (Berlin). 1911 Osmia mitsukurii Cockerell, Proceedings of the United States National Museum, 39: 639. Type material: Holotype f, [Japan], USNM (Washington).-Synonymy in Yasumatsu and Hirashima (1950: 3). 1931 Osmia (Pachyosmia) heudei Cockerell, American Museum Novitates, 466: 2. Type material: Holotype f, “Zi-ka-wei” [China], AMNH (New York).-Synonymy in Yasumatsu and Hirashima (1950: 3). Distribution-Northern Asia: J, RC, ROK. Identification-Keys, Descriptions: Wu (2006); Yasumatsu and Hirashima (1950). Flower preferences: Polylectic; pollen sources include plants belonging to 7 different families; flowers of Brassicaceae are the most important pollen hosts (Haider et al., 2013). 1899 Osmia kohlii Ducke, Entomologische Nachrichten (Berlin), 25: 213. Type material: Lectotype f, by designation of Peters (1978a: 306), “Sicilien” [Italy: Sicily], NMW (Wien); paralectotypes mm, ff.-Combination Osmia (Pachyosmia) kohli Ducke in Friese (1911b: 127). Distribution-Europe: I, I(Si), M; F(Co). Northern Africa: DZ?. Identification-Keys, Descriptions: Benoist (1931); Ducke (1900); Peters (1978a). Flower preferences: Polylectic; pollen sources include plants belonging to 11 different families; flowers containing no or very little nectar, such as Papaver (Papaveraceae), Ranunculus (Ranunculaceae) or Cistaceae, are important pollen hosts (Haider et al., 2013). 1875 Osmia longicornis Morawitz, Travel to Turkestan by A. P. Fedtschenko, p. 78. Type material: Lectotype f, by designation of Tkalcu (1969a: 343), “Taschkent” [Uzbekistan], ZMHB (Berlin); paralectotype m.-Combination Osmia (Pachyosmia) longicornis Morawitz in Friese (1911b: 125). Distribution- Europe: Caucasus. Northern Asia: UZ. Southwestern Asia: AFG. Identification-Keys, Descriptions: Ducke (1900); Peters (1978a); Romankova (1985b: 943-944); Tkalcu (1969a: 343). Flower preferences: Probably polylectic; the few available pollen samples contained pollen of Rosaceae and Salix (Salicaceae) (Haider et al., 2013). 1985 Osmia (Osmia) opima Romankova, Zoologicheskiy Zhurnal (Moscow), 64: 942. Type material: Syntypes m(m), f(f), “Primorye, 14 km north of the village Kievka” [Russia]. Distribution-Northern Asia: RC(NE), RC(NO), ROK, RUS(FS). Flower preferences: Polylectic (T. Romankova, personal communication). 1919 Osmia (Pachyosmia) pedicornis Cockerell, Proceedings of the United States National Museum (Washinton), 55: 182. Type material: Holotype f, “Soochow” [China], USNM (Washington); paratype m.
Distribution-Northern Asia: J, RC(CE), ROK, RUS(FS). Identification-Keys, Descriptions: Romankova (1994: 123, 1995); Wu (2006); Yasumatsu and Hirashima (1950). Flower preferences: Polylectic; pollen sources include plants belonging to 7 different families; flowers containing no or very little nectar, such as Quercus (Fabaceae), Ranunculus (Ranunculaceae) or Juglans (Juglandaceae), are important pollen hosts (Quest, 2009; Haider et al., 2013). 2004 Osmia quadricornuta Wu, Acta Zootaxonomica Sinica, 29: 531. Type material: Holotype f, “Yunnan, Kunming Xishan (25°N, 102.2°E), 2100 m” [China], IZCAS (Beijing); paratype m.
1931 Osmia (Pachyosmia) rufina Cockerell, American Museum Novitates (New York), 466: 3. Type material: Holotype f, “Zô-Sè” [China], AMNH (New York). 2004 Osmia rufinoides Wu, Acta Zootaxonomica Sinica, 29: 532. Type material: Holotype f, “Shanghai” [China], IZCAS (Beijing); paratypes ff. 1873 Osmia Taurus Smith, Transactions of the Entomological Society of London, 1873: 201. Type material: Syntypes m(m), f(f),”Hiogo” [Japan], BMNH (London). 1911 Osmia matsumurae Cockerell, Proceedings of the United States National Museum, 39: 640. Type material: Holotype m, “Sapporo” [Japan], USNM (Washington).-Synonymy in Yasumatsu and Hirashima (1950: 2). Distribution-Northern Asia: J, RC, ROK, RUS(FS). Identification-Keys, Descriptions: Romankova (1984, 1995); Wu (2006); Yasumatsu and Hirashima (1950). Flower preferences: Polylectic; pollen sources include plants belonging to 9 different families; flowers containing no or very little nectar, such as Juglans (Juglandaceae), Quercus (Fabaceae) or Liquidambar (Altingiaceae), are important pollen hosts (Quest, 2009; Haider et al., 2013). 1811 Osmia tricornis Latreille, Encyclopédie Méthodique, Histoire Naturelle, Insectes, vol. 8, p. 575. Type material: Syntypes m(m), f(f), “environs d’Aix, Montpellier” [France].-Combination Osmia (Ceratosmia) tricornis Latreille in Schmiedeknecht (1885: 19 ). Combination Osmia (Pachyosmia) tricornis Latreille in Friese (1911b: 126). Distribution-Europe: AND, E, E(Ba), F, F(Co), I, I(Sa), P. Northern Africa: DZ, E(Ca), LAR, MA, TN. Identification-Keys, Descriptions: Benoist (1931); Ducke (1900); Peters (1978a); Radoszkowski (1887a: 292); Schmiedeknecht (1885-1886). Flower preferences: Polylectic; pollen sources include plants belonging to 12 different families; flowers of Cistaceae and to a lesser extent Papaver (Papaveraceae) are the two most important pollen hosts, both of which contain no or very little nectar (Vicens et al., 1994; Haider et al., 2013). 2004 Osmia (Osmia) yanbianense Wu, Acta Zootaxonomica Sinica, 29: 532. Type material: Holotype m, “Jilin, Yanbian (42.9°N, 129.5°E)” [China], IZCAS (Beijing); paratype f.
1841 Osmia emarginata Lepeletier, Histoire Naturelle des Insectes, Hyménoptères, vol. 2, p. 317 [not seen]. Type material: Holotype f, “Bois du Vésinet, près Saint-Germain-en-Laye” [France], MNHN (Paris). Type species of Aceratosmia Schmiedeknecht.-Combination Osmia (Aceratosmia) emarginata Lepeletier in Schmiedeknecht (1885: 19 ). Combination Osmia (Pachyosmia) emarginata Lepeletier in Friese (1911b: 125). Distribution-Europe: B, E, F, F(Co), I, I(Sa), L, P. Northern Africa: DZ, MA, TN. Southwestern Asia: IL. Identification-Keys, Descriptions: Banaszak and Romasenko (2001); Benoist (1931); Ducke (1900, incl. Osmia mustelina); Peters (1978a); Schmiedeknecht (1885-1886, incl. Osmia mustelina); Tkalcu (1971). Misapplication: Historically often confounded with Osmia mustelina Gerstaecker, see Tkalcu (1971). Flower preferences: Polylectic; known pollen sources are Echium (Boraginaceae), Cistaceae, Fabaceae, Papaver (Papaveraceae) and Lamiaceae (Haider et al., 2013). 1841 Automatically established nominotypical subspecific taxon (original description and type specimen are identical with those of the species rank taxon of the same name above). Distribution-Europe: B, E, F, F(Co), I, I(Sa), L, P.
1928 Osmia emarginata fusca Benoist, Bulletin de la Société des Sciences Naturelles du Maroc (Rabat), 8: 215. NOMEN PRAEOCCUPATUM [not Apis fusca Christ, 1791; not Osmia fusca Gistel, 1857]. Type material: Syntypes m(m), f(f), “Moyen Atlas, au sud de Taza: Tizi n’Bouftène (2300 m), Tasrah des Ighezrane (2300 m)” [Morocco], MNHN (Paris). 1978 Osmia emarginata infuscata Peters, Senckenbergiana Biologica (Frankfurt), 58: 310. NOMEN NOVUM with same type specimen for preoccupied Osmia emarginata fusca Benoist, 1928 [not Apis fusca Christ, 1791; not Osmia fusca Gistel, 1857]. 1875 Osmia Fedtschenkoi Morawitz, Travel to Turkestan by A. P. Fedtschenko, p. 81. Type material: Syntypes m(m), f(f), “prope Samarkand” [Uzbekistan].-Combination Osmia (Chalcosmia) fedtschenkoi Morawitz in Friese (1911b: 114). Combination Osmia (Aceratosmia) fedtschenkoi Morawitz in Tkalcu (1969a: 340). 1904 Osmia (Ceratosmia) balucha Nurse, Journal of the Bombay Natural History Society, 15: 573. Type material: Lectotype f, by designation of Tkalcu (1969a: 341), “Quetta” [Pakistan], BMNH (London); paralectotype m.-Synonymy in Tkalcu (1969a: 340). 1930 Osmia usbekistana Cockerell, The Annals and Magazine of Natural History, ser. 10, 5: 408. Type material: Lectotype f, by designation of Tkalcu (1969a: 341), “Tashkent” [Uzbekistan], BMNH (London).-Synonymy in Tkalcu (1969a: 340). Distribution-Northern Asia: TJ, TM, UZ. Southwestern Asia: AFG, PAK. Identification-Keys, Descriptions: Ducke (1900); Peters (1978a); Tkalcu (1969a: 341-342). Flower preferences: Polylectic with a strong preference for Fabaceae; other known pollen sources are Rosaceae, Brassicaceae, Lonicera (Caprifoliaceae) and Salix (Salicaceae) (Haider et al., 2013). 1875 Osmia melanocephala Morawitz, Travel to Turkestan by A. P. Fedtschenko, p. 80. Type material: Syntypes m(m), f(f), “in valle Sarafschan” [Tajikistan].-Combination Osmia (Pachyosmia) melanocephala Morawitz in Friese (1911b: 124). Combination Osmia (Aceratosmia) melanocephala Morawitz in Tkalcu (1969a: 340). Distribution-Northern Asia: KS, KZ, MGL, RC, RUS, TJ, TM, UZ. Identification-Keys, Descriptions: Ducke (1900); Peters (1978a); Radoszkowski (1886: 13); Tkalcu (1995: 142); Wu (2006); Zanden (1996b: 895). Flower preferences: Polylectic with a strong preference for Fabaceae; other known pollen sources are Rosaceae, Monokots, Lonicera (Caprifoliaceae) and Boraginaceae (Haider et al., 2013). 1869 Osmia mustelina Gerstaecker, Entomologische Zeitung (Stettin), 30: 348. Type material: Lectotype f, by designation of Tkalcu (1971: 225), “Franken (bei Culmbach)” [Germany], ZMHB (Berlin); paralectotype f.-Combination Osmia (Aceratosmia) mustelina Gerstaecker in Tkalcu (1969a: 340).-Synonymy with Osmia emarginata Lepeletier in Friese (1911b: 125), rejected by Tkalcu (1971). Distribution-Europe: A, ARM, CH, CZ, D, FL, GE, GR, H, HR, I, I(Si), L, MK, PL, RO, RUS, SK, SLO, UA. Southwestern Asia: IL, IR, RL, TR. Identification-Keys, Descriptions: Amiet et al. (2004); Banaszak and Romasenko (2001); Ducke (1900, incl. Osmia emarginata); Medvedeva (1978, as Osmia emarginata); Móczár (1958, as Osmia emarginata); Peters (1978a); Scheuchl (1996); Schmiedeknecht (1885-1886, incl. Osmia emarginata); Tkalcu (1971; 1974b: 339-340). Misapplication: Historically often confounded with Osmia emarginata Lepeletier, see Tkalcu (1971). Flower preferences: Polylectic; known pollen sources are Fabaceae, Papaver (Papaveraceae), Cistaceae, Boraginaceae (Echium, Anchusa) and four other plant families (Amiet et al., 2004; Westrich, 1989; Haider et al., 2013). 1935 Osmia emarginata griseohirta Alfken, Mitteilungen aus dem Entomologischen Verein in Bremen, 23: 23. Type material: Lectotype m, by designation of Tkalcu (1971), “Elburs, Pish-Kuh” [Iran], ZMHB (Berlin).-Combination Osmia (Osmia) mustelina griseohirta Alfken in Tkalcu (1971: 226). Distribution-Europe: ARM, GE, GR. Southwestern Asia: IR, TR. Identification-Keys, Descriptions: Peters (1978a); Tkalcu (1971). 1869 Automatically established nominotypical subspecific taxon (original description and type specimen are identical with those of the species rank taxon of the same name above). Distribution-Europe: A, CH, CZ, D, FL, GR, H, HR, I, L, MK, PL, RUS, SK, SLO, UA. Southwestern Asia: IL, RL, TR. 1978 Osmia (Osmia) mustelina umbrosa Peters, Senckenbergiana Biologica (Frankfurt), 58: 313. Type material: Holotype f, “Palermo” [Italy: Sicily], SMFD (Frankfurt); paratypes ff. 1978 Osmia (Osmia) mutensis Peters, Senckenbergiana Biologica (Frankfurt), 58: 315. Type material: Holotype f, “Mut, Sertavul, 1600 m” [Turkey], SMFD (Frankfurt). 1899 Osmia bicolor nigrohirta Friese, Entomologische Nachrichten (Berlin), 25: 25. Type material: Holotype f, “Poros” [Greece], ZMHB (Berlin).-Combination Osmia (Aceratosmia) nigrohirta Friese in Tkalcu (1969a: 340). Distribution-Europe: AL, GR, MK; Caucasus.Southwestern Asia: IR, RL, TR. Identification-Keys, Descriptions: Ducke (1900); Peters (1978a); Tkalcu (1974b: 339-340). Flower preferences: Polylectic; known pollen sources are Fabaceae (e.g. Onobrychis), Echium (Boraginaceae), Lamiaceae, Cistaceae, Asteraceae, Brassicaceae and four other plant families (Haider et al., 2013).